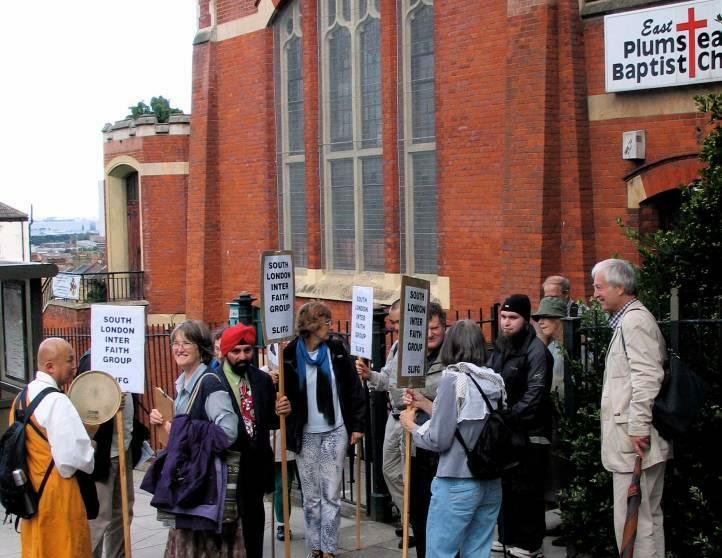 One of South London Inter Faith Group’s walks last year. Here are three generous invitations to break the fast (‘iftar’) with Muslim friends during the month of Ramadan. LBFN members and others from different religious and belief traditions are very welcome. Monday 22 July Muslim sisters at the Rockingham Women’s Group invite women and children to Harper Road (Baitul Aziz) Mosque, I Dickens Square, SE1 4JL, at 8pm for a meal after 9pm. Nearest Tube station – Elephant & Castle. Borough Buses 133, 40, 35. Wednesday 24 July The Old Kent Road Mosque and Islamic Cultural Centre, 365 Old Kent Road, SE15 5JH has invited all who are interested to break the fast and to arrive at around 8pm. The invitation is to St Peter’s Church, Walworth, and other local churches. A walking party will be leaving St Peter’s Church at 7.30pm. “This will be a great opportunity to witness a little bit of Ramadan and to enjoy the friendship which exists across our faiths. The generosity and hospitality of the local Muslim communities in making these invitations is a great example to all of us. Muslim brothers and sisters will have been fasting from dawn, around 3.00am, and the fast continues until sunset which is around 9pm. It is a complete fast which means no food or liquids. Any visitors to the iftars are invited to fast for all or part of the day if they wish to. If you would like to come to either or both evenings you are welcome to just turn up, but it would be very helpful if you could let me know by email siriol.davies@southwark.anglican.org or text 07913 470 816. Sunday 28 July At Southwark Cathedral, London Bridge, SE1 9DA, the South London Inter Faith Group is marking the end of its photo-exhibition there celebrating 16 years of inter faith walks. All who are interested are invited to view the exhibition (7.30pm), to hear a short explanation of Ramadan and Iftar (8.30pm) and to join Muslim brothers and sisters for the call to prayer and iftar (around 9pm – 10pm). Download the flyer here. The Exhibition is open to the public every day from now until 28 July. Please let me know if there are similar opportunities in other parts of London. This entry was posted in London Peace Network, Peace-building, Southwark and tagged iftar, Old Kent Road Mosque, Ramadan, Southwark, Southwark Cathedral, St Peter Walworth by Catriona Robertson. Bookmark the permalink.